We got married on the 23rd of September 2017 in Stresa, Lake Maggiore. It was perfection from start to finish thanks to Valentina and Ernesto! We first met with Valentina and Ernesto in October 2016 to begin planning our wedding, from the very start it was clear that their knowledge of the area, and expertise was second to none. They are very friendly and warm people and they made the entire experience highly enjoyable. They are both very responsive to emails and organise skype conversations frequently. Valentina was fantastic at conveying my thoughts and ideas to vendors, and completely understood my vision for the wedding. There was no stress whatsoever in the lead up to the wedding, we knew Valentina and Ernesto had everything under control. On the day of the wedding they made sure everything ran smoothly, every last detail was perfect. Our guests said it was not only the best wedding that had ever been to, but one of the best weekends they ever had! We cannot thank Valentina and Ernesto enough for creating our perfect day. Hi Orla and James, thanks so much for your kind words and for sharing your special day with us!! It was a pleasure and honor to be by your side for your amazing day. Your choices were just the perfect ones and it was a great pleasure to put them together to make your dreams come true. We had an amazing time and a fantastic adventure with you and anytime in Italy you are welcome! An absolutely perfect service provided by Katiuscia Minozzi, I have worked in 5 star establishments in events for 10 years and Katiuscia Minozzi gave the best service i have EVER come across. She is knowledgeable and understands how to service a client perfectly. Hi Maree, I wish to thank you for your amazing words, I'm so happy you appreciated my assistance especially considering you have a background in event planning. 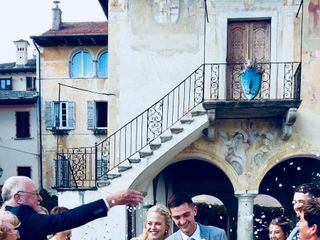 We got married in Orta San Giulio on the 7th September 2018. The wedding was amazing and I think it’s fair to say that everyone was blown away with the whole thing. From start to finish everything worked really well, Valentina and Ernesto at the "Italian Lakes Wedding Company" certainly know their stuff! Ernesto makes you feel at ease and Valentina makes you feel special. They are a great team and nothing is too much trouble for them. One of their recommendations was to host a pizza/pasta party in “Venus” the night before the wedding and that was a real hit with our guests. The pizza just kept on coming and stayed hot, and people particularly commented on how good the red wine was. And seeing everyone the night before made the next day a lot easier, I thought! Initially the weather forecast held thunder and lightning for the wedding day, but Valentina told us to stay positive and as usual she was right. I don’t think we could have been any luckier with the weather, although some of the boys in kilts would possibly have preferred it to be a bit cooler! From start to finish everything on the wedding day was fabulous. The hairdresser and make-up artist that Valentina had organised were superb. They came to the apartment, made us look good (!) and were calming and easy to work with. They both did a great job, I was really pleased. I thoroughly enjoyed the short boat ride to the ceremony, which took place at the town hall. I had been thinking that it was a bit over the top, but it gave me a giggle at the time and made me and my young bridesmaids feel like we were being spoilt. It was quite a treat. The setting for the ceremony was just beautiful. The town hall provides perfectly manicured gardens, in full bloom, overlooking the lake and surrounded by the beautiful Italian buildings. Everyone just adored the setting, it was really stunning. Valentina had organised a harpist for us who was wonderful and I think was the calming effect Dougie, the groom, was needing. Everyone really enjoyed the harpist, the lady was very good and set the atmosphere for the ceremony. The lady and gentleman who conducted the ceremony were just lovely and very professional. We were not sure what to expect really, and they really made us feel welcome, that they were delighted to have us there. The translator was witty and we all had a laugh with him. We were delighted to receive the book of Orta San Giulio, and it takes pride of place in our home. Valentina and Ernesto were on hand every step of the way, running ahead to ensure that everything was well organised. Every detail was as we had agreed before the big day. The wee walk down the street was an unexpected surprise for everyone, with bystanders clapping, and there were several photos taken off the men in their kilts. The feedback from our guests was that they felt really special and felt like it was a Hollywood wedding! Everyone also really enjoyed the ice cream in the main square, I am really glad we went for that, it was a great recommendation from Valentina. And then back to Venus again for Prosecco! The staff in Venus were brilliant, they looked after us very well both days we were there. And then to the boat rides… Ernesto had arranged for us to go to the island for photographs and it was lovely and so quiet. We were itching to get back to the party I have to say, but it was a lovely interlude really. Andrea, the photographer from independent pictures, was very professional and kind and encouraged us to chill out. Ernesto ensured all of our guests got to the reception by boat also. We didn’t get to see the guests arrive at l’Ustaria Ca Dal Rat, but everyone was blown away with the boat trip and then arriving to aperitivo. It was nice to see them all with their sunglasses on looking out over the lake when we arrived. They are now telling everyone that will listen, that it was like something out of a glossy magazine! When we arrived, again we felt really special. The guests hadn’t noticed that we weren’t already there, so we made quite an entrance. I just loved getting off the boat to the song we had chosen. I had forgotten we had done that, so it was a nice surprise! Again another detail that did not get missed by the team. The Aperitivo were fabbie by the way! Our guests thought they were delicious as did we. Valentina had gotten to the restaurant earlier and had set out the tables exactly as we had asked, with decoration, favours and the seating plan. She did a brilliant job and the whole place looked stunning as the sun went down over the lake. The meal itself at the restaurant was wonderful. People have particularly commented on the cauliflower soufflé (we would love the recipe! ), the pear risotto, and the sea bass. But everything that Carlos cooked was fantastic, it was all cooked to perfection. We had one night left at the end of our holiday and we went back to Lake Orta just so that we could eat there again and try something else. Again, it was wonderful. Enrico looked after us very well on both visits. To be honest I am looking forward to going back again. The restaurant had put together a ‘cheese’ cake for us; it looked great and it had melt in the mouth cheeses. We used “Audiodress” (another great recommendation from Valentina) for the music all evening. From start to finish “Audiodress” were brilliant to deal with. They always responded really quickly when we wrote to them. I loved the DJ, I thought he was great, and he played everything we had organised, even down to the Ceilidh dancing! So we just want to say, Valentina and Ernesto, thank you both very very much. We thoroughly enjoyed our wedding and I am actively encouraging someone else (anyone) to do the same so that we can go along and be a guest. And I will be encouraging them to use your services. Some of the guests have commented that it was the best wedding they have ever been to. 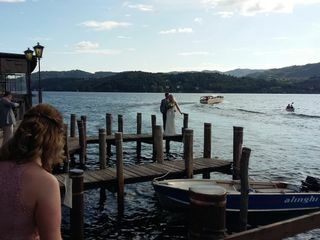 Many of the guests have commented that the whole day was very relaxed, and why would it not be with Italian Lakes Wedding in charge, we had nothing to worry about! We honestly cannot thank you enough. Once you arrived, I knew everything was taken care of. You know everyone and have obviously chosen the best people to work with. Every single part of the wedding was exactly as we had arranged, the team that you put together were all excellent, and you made our dream wedding a reality. We both wish we could do it all again! Isola Del Garda - Dream come true! Absolutely perfect from start to finish. Kat and Sara were amazing help and catering to all our wishes and needs throughout. Very professional on the day. Ran so smoothly without having to worry about a thing. Just sat back, relaxed and enjoyed It with family and friends. By the end of the day if felt like the they were apart of our family as they had been so great. We Cannot thank them enough and we would 100% recommend to anyone. We can not thank Ernesto and Valentina enough for all there help and hard work during the planning and on the wedding day. Sara & Kat are fantastic! They helped us every step of the way and Sara was always on hand to answer my many questions and she made the entire planning process as stress free as it can be! Our wedding day was even better that we could have wished for and we are so grateful to Sara & Kat for all of their help! I am based in New York and one of the toughest decisions was trying to find an overseas planner for a wedding in Lake Como. Alessandra and her team were FLAWLESS. They completely took away anxiety and made the entire process very easy for us. On the day of the wedding, hair and makeup arrived promptly and created a look for me that completely matched the photos I sent and what I was looking for. The photographer she booked took editorial, magazine quality photos. Our officiant put together a beautiful reading and ceremony... all of this without meeting any of the vendors or vetting them beforehand. Alessandra handled everything and put the most beautiful day together that we could have hoped for. I cannot say enough about her and the beautiful program she created. If you are looking for a wedding in Italy or on the lakes, her company is hands down the company that MUST be used. HIGHLY HIGHLY recommended for your once in a lifetime experience. We have been lucky to meet Valentina and Ernesto. They have so well taken care of us and so well organized our intimate wedding ın Barbaresco ! Nothing went wrong and all their advices, for example the site of the wedding, the hotel we stayed, etc. You can trust them faithfully. Hope we'll keep in touch ! Alessandra assisted us with our elopement on the beautiful Lake Como. Coming from Australia, we relied on Alessandra completely for everything. The day before our wedding, there was a storm causing damage to roads, so last minute changes had to be made. Again, Alessandra made everything go smoothly and stress-free - just how we had wanted and imagined our day to be. I cannot thank and recommend Alessandra enough! Where do we start. Valentina and Ernesto were the ultimate professionals. From the very first day when we started planning our dream wedding, they delivered. Being Irish, living in Western Australia we knew that we needed people we could trust to make our dream a reality, and they certainly did that. Every detail was considered, options provided, changes made to accommodate our needs, we could not ask for more. On the day of the wedding it was just incredible to have a team of professionals working in the background to ensure everything went to plan. We were informed throughout and they managed the flow of they say to perfection. We could not ask for any more of these two. Thank you for everything. Valentina and Ernesto from Italian Wedding Company made our planning process so simple! Since we are in the United States, taking on planning a wedding in Italy was no easy task! From legal documents to language barriers to tiny, tiny details - we literally had nothing to worry about with Valentina and Ernesto taking care of it all. Their assistance with vendors made our day exactly as we wanted it - and they were all top notch! We communicated regularly and both really listened to what was important to us as a couple. 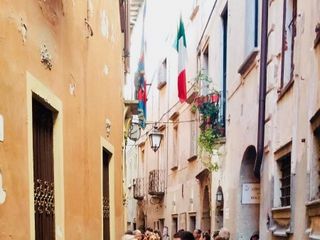 They made our day effortless and were so pleasant to work with - we now consider them friends and would recommend them highly to anyone planning a wedding in Italy! My husband and I are a Canadian couple, that always dreamed of having our wedding in Venice, Italy. However the process seemed quite daunting, that is until we came across the Italian Wedding Company. With the help of Katiuscia, we were able to elope and have a perfect day, She assisted with not only finding a wonderful photographer, florist and hair and makeup artist - but also with all of the paperwork. If this is the kind of wedding you are interested in, and we highly recommend it, than the Italian Wedding Company will help to make all your dreams come true! Valentina and Ernesto are not only the best wedding planners, but they are also one of the most caring and loving people that me and my husband have met in our entire lives. Valentina is everything you want in a wedding planner. She is extremely organized, she is understating with EVERYTHING, she is very very sweet, she accommodates anything that you wish, she tries very hard to give you the wedding of your dreams, she answers emails EVERY DAY, she answers the thousand questions that you may have about any little issue while still being the sweetest and nicest person in the world. Valentina made the most special day of my life the best. She also made the whole process very stress free and very enjoyable. Everyone thinks weddings are stressful, but Valentina made the whole process so pleasant that I was able to enjoy the wedding planning. She accommodated everything within our tight budget while giving us multiple choices of vendors. When I told her that I could not afford something she immediately was able to find solutions to find similar options with the similar quality, so I could have the wedding that I dreamt of. She was the one who made the happiest day of my life possible. If you want to have a perfect wedding day and an enjoyable and flawless planning process I would recommend Valentina without a doubt. 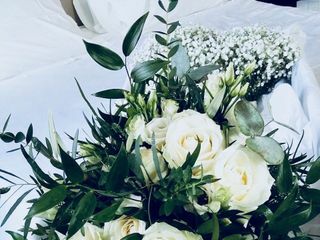 You will never forget your wedding, and you will never forget the amazing help that Valentina will give you in making your happiest day possible. Ciao Mariana, thanks so much for your wonderful words! We really got moved when we read all. I really do not know what to say but that you are wonderful people yourselves and it was a real pleasure meeting you and being part of your special day in Italy. Anytime you will get back to Italy we will be here for you to meet and spend some time together! Ciao thanks gracias grazie!! a big hug to all of you!! They were absolutely wonderful to work with and made our wedding day even better than we had imagined! The idea of planning a wedding abroad made me nervous initially, but after the first phone call and interaction - I could tell that they were organized, professional and understood how to get the best value while still realizing our goals for our wedding day. I highly highly highly recommmend them! Thank you so much Simi! We loved planning your wedding and spending a wonderful day together with you and your lovely friends and family. It was very important for us to make this day really special for you all. Lot of love from beautiful Lake Como! Thank you so very much for my fairytale wedding ... and making it all come true! Your services and guidance really made this the most special day of our lives. I would highly recommend your services to everyone! Thank you Belinda for your review and these beautiful pictures. They are a wonderful memory for us too! It was such a pleasure to work with you and feel you trusted us on each step of the wedding planning. I wish you all the best and I hope we will meet again! We got married at the Relais La Sommita in the city of Ostuni, in Puglia and it was perfect. Although we only communicated with Emanuela by email and Whatsapp it was all so easy. The Wedding Company organised everything. They are so professional. I cannot recommend Emanuela and Michela highly enough. We wanted a very small and intimate wedding as it was only the two of us. Emanuela understood this completely. She listened to everything I said and organised the most beautiful wedding for us. Emanuela worked closely with the wonderful staff at the beautiful Relais La Sommita to create the most special day. The dinner in the evening on the terrace was simply magical, looking out over the breath taking views of the city and beyond. And the food was absolutely exquisite. To Emanuela and Michela thank you from the bottom of our hearts for making our wedding day so special. AMAZING!! simply amazing service. I contacted the Italian wedding company two weeks before I decided that I wanted to have my wedding pictures taken in Italy. Everything was last minute and my heart was set on Villa de Balboanello in Como but I didn't know anyone or anything about Italy. I tried to contact some photographers and everyone told me to forget it as i needed to book one year in advance and i found it so difficult to arrange anything. I lost hope and just sent a last message to the company just so i see what they say. To my surprise , IWC were extremely prompt in their reply. Alessandra who i was dealing with sent me a full plan the next day and it was PERFECT! I couldn't believe how easy they made the process. and she understood exactly what I needed. 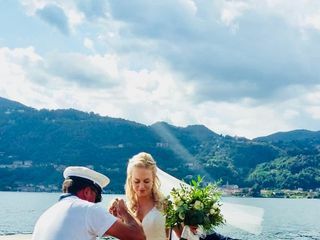 The planning included hair and makeup , flower bouquet , a professional photographer, the locations , a boat and even recommendation on where to stay. She set a plan and everything went perfectly and i couldn't have asked for a more professional and amazing team to surround me on my special day. She was easy to communicate with, extremely friendly and always reachable. I truly recommend them to anyone planning to wed in Italy. Our Journey with Valentina and Ernesto started just over a year ago and I can honestly say it has been the best year of our lives so far. From the first email with Valentina she was so welcoming and knew exactly what we wanted to create. We met them both in Orta to check out various venue options and they could not have made us feel more welcome. There was no rush to our meeting and no detail or option missed for us to see. They even helped arranged lunches and boat trips for the rest of our stay. We fell in love with Orta as well as Valentina and Ernesto and knew they were the perfect couple to help us make our dream wedding come true. Once the date was set they were on hand 24/7 no request was too much, and believe me I pestered them and changed my mind A LOT. Without them I doubt we would have even managed to book the church. So many people think a wedding planner just makes the day look pretty but this couple do far far more! From helping with the legal paperwork/ arranging our local priest to marry us/ food/ wine/ flowers/ music/ ice-cream/ transport and most importantly fitting everything we wanted to our budget. They are not just a business but are personal in the event. 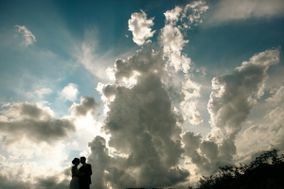 The morning of my wedding everything was planned and ready to go but the one thing we couldn’t control was the weather… Can you believe we spent the week in Orta with no rain but LUCKY ME the heavens opened on the 9th. Valentina came up to my room in the morning, gave me the biggest, warmest hug and said ‘Wet Bride’ ‘Lucky Bride’. I laughed and knew that it was all in hand and our day would still be perfect. So we made a few small changes like a car up the hill to the church and a white umbrella appeared from no-where but I can honestly say myself, husband and all of our guests still had the best day and this was all thanks to our amazing wedding planners. All the vendors recommended to us were spot on! I cannot recommend this amazing couple enough and want to thank them again! Oh Hannha, You made me cry, I'm so moved! Your words come from your big heart and they are incredibly sweet. Thanks so much for writing this lovely text and adding your photos. You are a star and you really made my day! We love you both so much and your group was amazing. Thank you so much and I'm looking forward to keep on being in touch for long time!!!!!! Much much love! Alexandra, Veronica, and Barbara were amazing. They were very responsive to questions and requests. 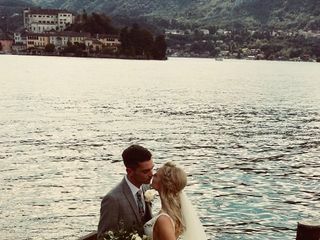 I was able to have a very beautiful wedding on Lake Como for my budget with everything I wanted! The best decision to choose Italian Wedding Company as our wedding planners - Ernesto, Valentina and Silvia were fantastic to work with. 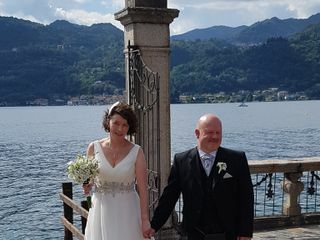 We had our wedding on Lake Orta, which was suggested to us by the Italian Wedding Company - and what a beautiful location, a great suggestion! Valentina had many great ideas and contacts, Silvia was present on our wedding day and did a wonderful job ( very friendly, approachable and professional) and Ernesto helped us out a lot with the paperwork (which we had some issues with!)! All of those involved with our wedding day did an amazing job and all were suggested by Valentina and Ernesto. Our day was truly magical and we couldn't have done without the Italian Wedding Company! Thank you so much for an unforgettable day! Our experience with Katiuscia was AMAZING!!!! !, our wedding day was absolutely MAGICAL and seamless. Katiuscia went above and beyond and she will forever have a special place in our hearts. Hi Franco and Cindy, I'm so happy you can keep a great memory of your special day. I spent a lovely time with you in Venice and I can't forget this amazing experience! I hope we can meet again someday. Thank you so much for your special words!